When a corporation commits a crime, whom may we hold criminally liable? One obvious set of defendants consists of the individuals who perpetrated the crime on the corporation’s behalf. But according to the responsible corporate officer (“RCO”) doctrine, the government may also prosecute and punish those corporate executives who, although perhaps lacking “consciousness of wrongdoing,” nonetheless have “a responsible share in the furtherance of the transaction which the statute outlaws.” In other words, under the RCO doctrine, a corporate executive can come to bear criminal responsibility for an offense of her corporation that she neither participated in nor culpably failed to prevent. As long as the executive in question had the authority to prevent the corporate crime and failed to do so, she may be targeted in a criminal suit. The RCO doctrine plainly poses a challenge to our traditional understanding of criminal culpability, according to which guilt is individual—one may be held responsible only for a wrong one has personally committed, and only if one has done so with a guilty mind. Thus, RCO liability, while representing the most common instance of strict criminal liability, has been deemed “at odds with fundamental notions of our criminal justice system,” and likened to the primitive doctrine of frankpledge, under which innocent members of a group could be punished for the wrongful deed of one of their fellows. On the other hand, corporate crimes have an irreducibly collective aspect. If we take this aspect seriously, as this paper does, then departures from the paradigm of individual culpability may well be warranted. In particular, we may be justified in assigning responsibility not just to the corporate crime’s immediate perpetrators, but also to those who held prominent positions within the corporation at the time of the crime’s occurrence, and this responsibility may license just the kind of criminal liability that the RCO doctrine contemplates. 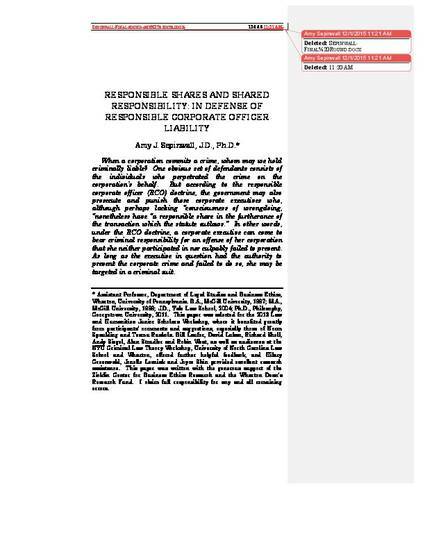 This paper seeks to determine the circumstances under which this extension of responsibility is permissible, and the grounds of its permissibility. More specifically, this Article critiques existing justifications for the doctrine by arguing that these mistakenly construe it as a kind of negligence liability, and in so doing deprive the doctrine of its transformative power. It next offers a defense of the doctrine, according to which personal guilt is not necessary, and then contends with objections to the doctrine, arguing that we need not dispense with the doctrine altogether in order to avoid the concerns of its critics. What is needed instead is a set of guidelines that guard against the doctrine’s misuse or abuse. Finally, this Article ends with a specification of these guidelines.